It was first seen eighty-ine years ago today. The new Duchess of Windsor, minus the HRH denied to her on her marriage, walked down the steps of the Chateau de Cande, near Tours, to worldwide interest. This was the bride for whom a kingdom and an empire had been renounced. Wallis, never knowingly outdressed at any moment of her life, was ready for her close up. The bride chose a fitted gown by Mainbocher for her wedding day. Fitted, from the ruched neck to the slimline skirt, it was the epitome of thirties elegance. Made of silk crepe, it featured a nipped in waist with button details and long sleeves with high neck. It was modest and demure and still the height of fashion. Wallis dressed for the moment, the image of a discreet bride but with all the elements of style and mode for which she had become known. Perhaps the most surprising thing about this dress is that is it blue. Wallis blue. The colour was said to have matched her eyes exactly. Of course, it went around the world to the huge audience hungry for news of the match in black and white. That perhaps made the photos even more iconic. Edward, just months before a king and emperor in all his regalia, was now a royal duke in morning suit. Wallis, the woman for whom he had given up the legacy of Queen Victoria, was all Parisian elegance without an ostentatious jewel in sight to spoil the show. There they stood, blinking in the almost too bright sun, against the bleached out stone of their fairytale wedding castle. In reality, it was a bright and breezy chapter of a day their romance was sealed. For history, a monochrome moment that verges on the uncomfortable. Even the photos taken later inside, the official record of this momentous royal romance at its pinnacle, carry an air of uncertainty. 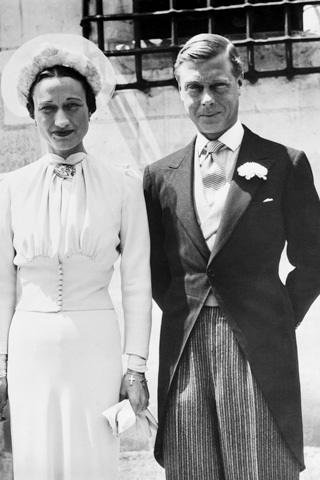 Wallis' wedding dress remains one of the most famous royal gowns of all time. The Duchess of Windsor would later donate it to the Metropolitan Museum, handing over an iconic piece not just of royal fashion but of royal history. That famous blue colour didn't last - the gown faded naturally, over time, and is now deep cream. But it remains a dress that will be viewed for centuries to come, as the story of Edward and Wallis continues to fascinate. And it all began on this day, in the bright sunshine of France.